Canoe Hire: TUESDAY OPENING DURING THE SCHOOL HOLIDAYS. STARTING ON JULY 24TH, 2018, CANOES AND KAYAKS ARE FOR PUBLIC HIRE EACH TUESDAY MORNING OF THE SUMMER SCHOOL HOLIDAYS at COED GWILYM PARK, CLYDACH, SA6 5NS. The first hire is at 10.00am and the last hire is at 12.30pm. The canoe operation is a huge bonus for SCS, thanks to the hard work of all the volunteers involved. The Society is doing something positive for the community. Rafts £10, Canoes £7, Kayaks £5 and £4. Full details,terms and conditions can be found under Canoe Hire on this website. Previous postTHE CLYDACH BURIED LOCK SITE: UPDATE 22.8.18. 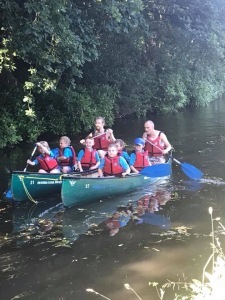 Next postWORK PARTY, CANOES AND CANAL AND RIVER TRUST VISITS; 24.7.18.